This entry was posted on February 3, 2015 by Jessica Anderson. Are you looking for something exceptional for your loved one for this Valentine's Day? Consider a personalized gift or customized trophy! Below are some ideas to make your romantic day and night even more special! Our engraved hearts make cherished gifts that will be remembered for years to come! 1. Engraved Hearts: The quintessential expression of love, an engraved heart makes a perfect Valentine's Day gift. 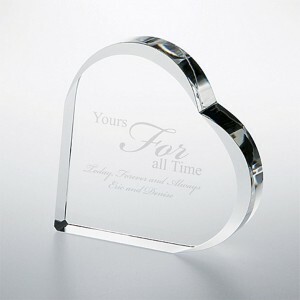 We offer a few styles of personalized hearts in both crystal and acrylic. Write an affectionate message and we can engrave it directly onto the heart. 2. Engraved Vase: Our Vinata crystal vase is the perfect vessel for your special flower bouquet. Engrave your wedding date, date of first kiss, or a tender endearment for your Valentine. 3. 'World's Greatest' Trophy: Ideas include 'World's Greatest' Husband, Wife, Boyfriend, Girlfriend, Mom or Dad. An achievement trophy, such as an Oscar, is a great choice for this type of award. 4. Beauty and the Beast: If your Valentine has a good sense of humor (or a hot bod! ), our beauty queen or body builder trophy may be the perfect gift. Check out all of the options in our Beauty and the Beast joke category. What transforms these items into cherished gifts is the etching on the awards. Put some thought into making the engraving special, as your message will be treasured for years to come. Since the engraving space is limited make each word count. At Trophies2go, our engraving is free and we do not count characters. However keep in mind that the more words you use, the smaller the engraving font size will be. With our fast production time, we can get your personalized gift in time for the holiday. Just give us a call at 1-877-926-4700 with questions.